Rocker switches were the "brainstorm" of several guitar manufacturers engineers and marketing people during the late 1960's and early 1970's .....as were Roller Knob Pots, cheap (consumer grade) slide switches and slider pots .....all of which were not Player friendly and were notoriously unreliable, particularly as they began to age; And with the exception of slider switches, the rest can be a real agrivation of accidently bumping them into a position not desired, which they will easily do. But NOTICE in the schematic that only one end of these rocker switches serve a switching purpose. The 'OFF' position of each pickup and the 'RYTHM' position are the ends of the rockers that have switch functions; The other ends 'ON' and 'SOLO' have no function whatsoever other than to take the 'OFF' and 'RYTHM' functions out of the circuit. The 'OFF' position routes the pickup to an almost-Off volume dampening scheme in the circuit to blend that pickup with it's partner pickup (1+2 and 3+4) if the partner pickup is in the On position; While the 'ON' position removes the respective rocker switch from the circuit where the pickup is wired directly to it's pot. ~~~~~~~ Similarly, the 'RYTHM' position routes it's 2 partner pickups through a filter capacitor just like a tone pot does but without a pot to control that preset filter capacitor value, AND also routes the signal through a volume dampening scheme that blends the pickups per the loudest pickup desired by the On and Off position switches. SO, ....the only position the switches must be in to funcion is 'OFF' and 'RYTHM'. To get 'ON' and 'SOLO' all you have to do is move the rocker enough to disconnect the 'OFF' and 'RYTHM' position. ....ie. You don't have to move the swith all the way to the 'ON' or 'SOLO' position; ALTHOUGH the farther you move the rocker towards 'ON' or 'SOLO', the less chance you'll have of bumping the switch back into the 'OFF' or 'RYTHM' position. If the guitar is to be used as a player rather than a collector item that isn't going to be played often; Then the rocker switches can be removed and saved, and a plate with 3 regular 2-position (On-Off) toggle switches can be made to replace the rocker switches. The toggle switches would be wired so they function in the same direction as the rockers. And even though toggle switches are allot more reliable / stable; If the Player is a thrasher, then high-quality slide switches might be a consideration since toggle switches can also be bumped in that location by someone more focused on their thrashing than their playing. Worthy of note is how easy it is to replace these pickups magnets with Rare Earth ( Neodymium ) magnets for galactic output. 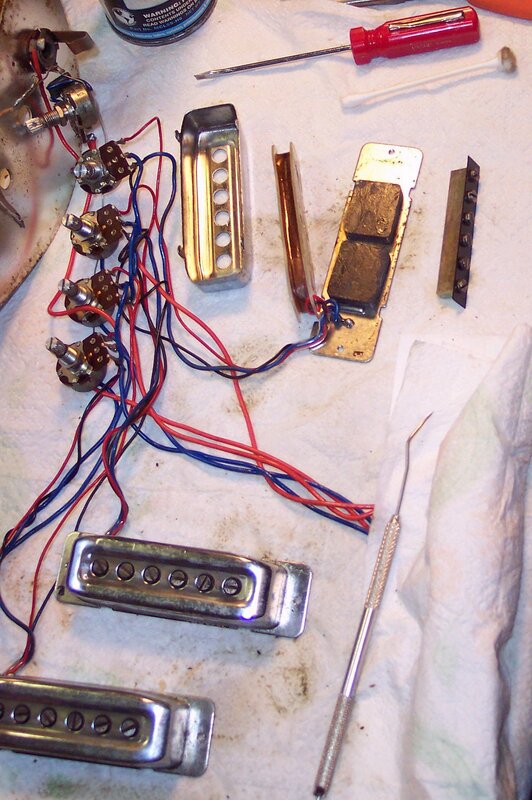 And with either the existing magnets or Rare Earth magnets, ....simply reversing the polarity of the magnets (flipping them over), and reversing the hook-up position of the coil lead wires' solder points into their pots, ...would create one pickup of a humbucking pair ! 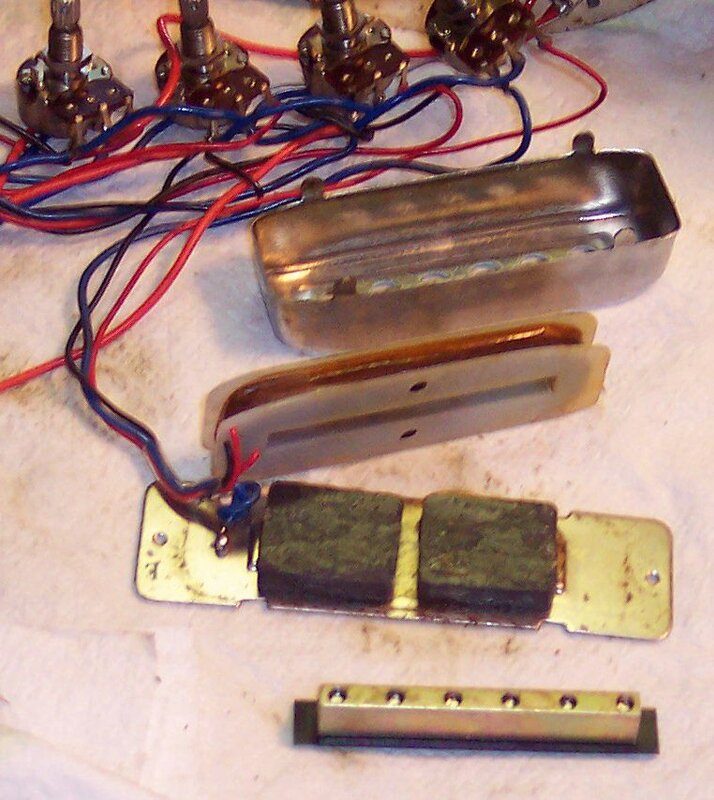 It is an old wives tale that a humbucking coil must be reverse wound; When in fact only the lead wires must be reversed to put the opposite magnet signal back into phase with the non-modified pickup in the humbucking pair of pickups. Although, there are other minor / subtle electronic and tone considerations for a reverse wound coil in a humbucking pair. WARNING: A person MUST study the DANGERS and precautions of working with Rare Earth magnets. Example info but not complete info. They are EXTREMELY strong. 1 cubic inch of Rare Earth magnet can lift about 1,000lbs ! And even smaller ones have enough power to break fingers if 2 or more of them decide to make contact while fingers are in between; And making such contact can be violent and unexpected due to old careless habits working with normal magnets. Rare Earth magnets are also brittle and can also explode violently if they are shattered. Also notice how easy these pickups would be to recharge fully assembled through their base plate, with a rather simple Rare Earth magnet jig. See some example instruction in this article at Stewart McDonalds. 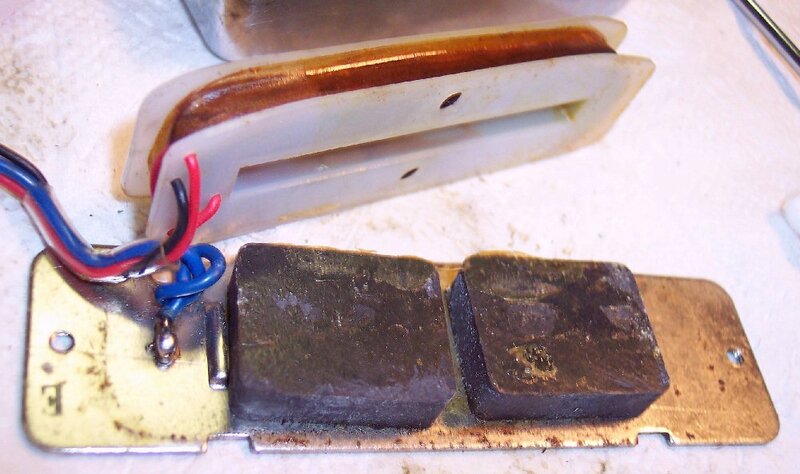 NEVER EVER EVER ALLOW A RARE EARTH MAGNET TO COME INTO CONTACT WITH A GUITAR PICKUP'S MAGNET(S) (or other magnet); You will find it MOST difficult to pull them apart, and even if you can you will have to start all over recharging them. MAKE and USE a vice jig as described in the article. The rare earth recharging magnets must be withdrawn from a pickup's magnets in a perfectly aligned direction (thus the vice); If this isn't done then any misalignment, wobble, sidward movement, etc. will cause the magnetic domains in the pickups magnets to follow the recharging magnets withdrawal directions which misaligns the pickups magnets domains, .....and "charging" a magnet is nothing more than realigning it's domains precisely. This first picture of rocker switch interior is unlabeled. See picture below this one for key parts labeled. 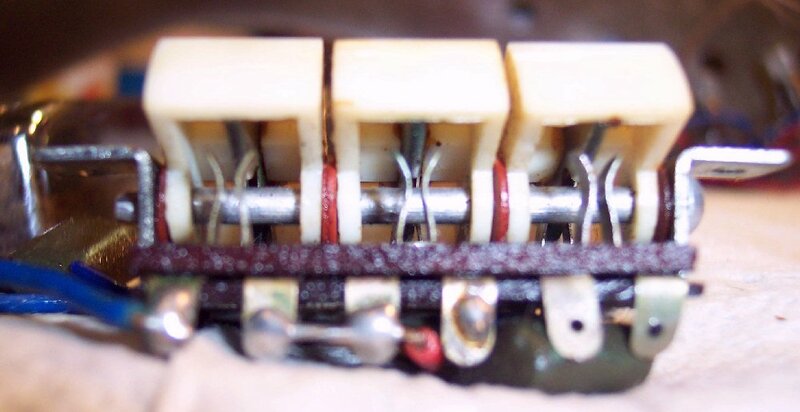 (1) Blade contact inside the top of each rocker switch that bridges the circuit across #2's pinching blade contacts. (2) Pinching dual isolated blade contacts that the #1 rocker blade contact inserts into to bridge #2's isolated contacts to complete that switch circuit. 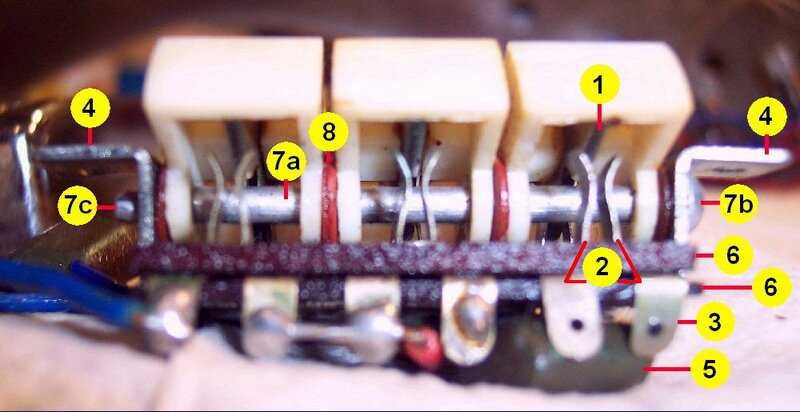 (3) Solder point tabs attached to each of the pinching blades. 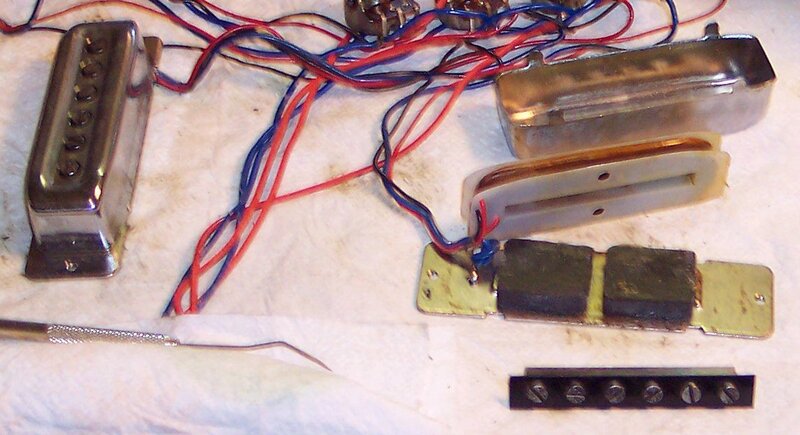 (NOTE): There are sets of these switching contacts and solder points (1, 2 & 3) on each end of each rocker; But only one end serves as a switch in this guitar while the other end's switch circuit is not connected to anything. So each rocker is basically an on / off switch for certain functions in a rather sophisticated passive circuit, not at all unlike some of Nate Daniel's creative and sophisticated circuit logic design in his Danelectro Dane models. (4) Tabbed and squared-off "U" shape steel bar that the switch mechnisms mount to and also acts as a case ground point. Ground connections in the switched circuits have a common solder point on the bottom center of this bar. (5) Filter capacitor for the 'Rythm' setting of the 'Rythm / Solo' rocker switch. (6) 2 Phoenolic plates that sandwich the contacts' and their solder lugs, creating a stable circuit board. (7a) The fulcrum axle pin that the rockers rock on. (7b) This end is a standard "carriage bolt" type end of the axle pin. (7c) This end is crimped and must be de-crimped to disassemble the rocker switches to access and thoroughly clean the switches contacts (see #1). (8) Spacer shim washers between each rocker. The pickups had not yet been cleaned up in these pictures. One pickup was opened up to inspect it's internal condition and planning the clean-up. The rocker switches are covered up here with a towel to protect them from any clean-up "splashing". The pickup consists of 2 magnets glued onto a base plate that also acts as a magnetic field reflecting lense, which is grounded into the total harness. The coil is wound around a molded nylon-type plastic bobbin that has a precicion vertical slot in it's center for the pole pieces slug to fit into. Notice that the coil has 3 wires. After the coil is sealed, it is wrapped with a foil tape and connected to the red "hot" wire to contain the energy of the coil, in addition to the base plate and pickup cover being grounded for shielding ! The pole pieces slug has a collar glued to it's top to retain the coil / bobbin in place as the slug is held in place by magnetic pull down upon the magnets. 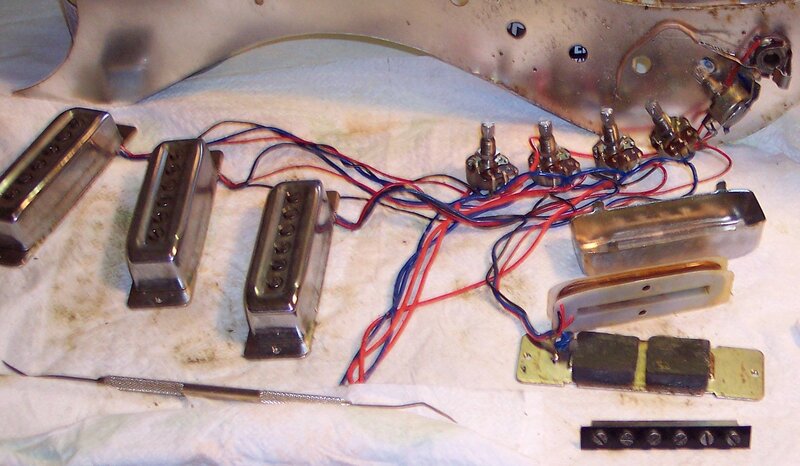 The pickup cover is held in place by 4 tabs that bend onto edge slots on the base plate. TRICK: Because Japanese guitar design philosophy back then was for a high fretboard and string height above the body deck, ....and most guitar manufacturers (nor Players) had not yet discovered the importance of getting the pole pieces right up close to strings for high / hyper dynamics (they still believed in clean undistorted sound); The pole piece screws in these pickups are often not long enough to reach close to the strings and still have plenty of thread communicating with the magnetized slug. So an old trick is to replace the pole pieces with carefully measured longer STEEL (and not stainless) screws available at most good hardware stores and surely at nut and bolt companies. If planning to do this trick, ...keep in mind and remember that longer screws cannot be screwed fully back into the slug, because they can be screwed down to the point that they will push upon the magnets which are brittle enough to break, and will otherwise push the slug and bobbin up off of the magnets.